Our VIPs – Volunteers in Partnership work every day to keep LOTUS beautiful and viable. Join us! We need you! 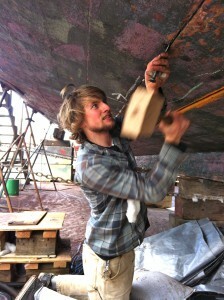 We have a marvelous boat, a plan and a great core of volunteers to show you the ropes. We look forward to having your energy and dedication, and all your good ideas. Our Mission – The Restoration, Preservation, and Funding of the M/V LOTUS, and the Education of all to the importance of the M/V LOTUS in the Maritime History of the Pacific Northwest. We open Lotus to the public more than half the year to share her history and offer the experience of living in a 1909 cruising houseboat. We endeavor to live in the simplicity of that era and to share our knowledge of historic household improvements at the turn of the century. It is our intent to encourage the basic skills and non toxic content of keeping a household and crew without plastic or chemicals; we serve organic fare to our crew and guests and encourage a conservative use of non replaceable and non essential products. 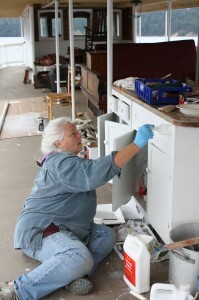 The M/V Lotus Foundation offers a variety of volunteer opportunities. Adult volunteers are 18 years and older, while our youth program invites people ages 12 – 17 to get involved. Join us at Orientation to learn more or get started. Orientations take place 2nd Saturday of the month from 10am-11am. ● Lotus Stewards start as a tour guide / docent. ● We share the history of the boat daily and you will learn by listening mostly. ● Keep the boat ship shape and clean. ● Participate in maintenance inside and outside. ● Support our visitors and guests ­ i.e. tea and toiletsWe hope you will participate in Work Parties, Special Events, Fund Raising Dinners and Visitor Services.We invite you to participate in our Advisory committees and help develop events and further programming.Of course the special skills you bring are of particular interest to the whole group and program – please ask to do anything you see that needs doing!We hope you will decide to make a commitment of time to the MV Lotus – 1 day a week or 1 day a month ­ it all adds up!After 40, 80 & 100 hours + of service we hope you will want to step up to learning additional skills that let you participate as deck, dock or engine room crew. Learning these skills will make you an even more invaluable part of our organization and crew as we transit to other ports for events and scheduled Open Boat Tours. We are thrilled that you want to participate in the worthy endeavor of keeping Lotus alive and active in the community and we pledge to work with you to create a safe, enjoyable, and productive working environment for you, your fellow volunteers and Lotus. ● View staff and other volunteers as allies, colleagues, leaders and team members –i.e. crew. ● When possible, give at least 2 days’ notice if you are unable to come to yourscheduled shift. ● Observe safety procedures for all boats, tools and docks. ● Seek and expect honest feedback on performance. Remember that feedback is atool for growth. Our policies are designed to provide guidance and direction to both staff and volunteers in regards to volunteer involvement and management efforts. Unless specifically stated, these policies apply to all volunteers in all programs and projects undertaken by or on behalf of the organization, and at all sites of operation of our programs. Alterations to or exceptions from these policies may only be granted by the Deputy or Executive Director, and must be obtained in advance and in writing. Policies and procedures not specifically covered in these policies shall be determined by the Executive Director. NO DRUGS – EVER ABOARD LOTUS – OR BY ANYONE ABOARD ANY BOAT ANYWHERE – ESPECIALLY NOT ON THE DOCKS AT THE HISTORIC SHIPS WHARF, OR THE CENTER FOR WOODEN BOATS. Tell your friends & advise any guest you bring aboard. No drug use aboard BY ANYONE and No drugs on your person or stowed in your belongings aboard. Federal Law does not recognize states rights to consume or carry drugs of any kind. All watercraft INCLUDING LOTUS – fall under the jurisdiction of the Federal Government of the United States. If you or your friend are found to have disregarded this policy you and your friend will be escorted off the boat and will not be allowed back aboard. This policy is made clear to Event Guests as well when they sign their event contract or register for an overnight stay. As a member of the Stewarding Crew of Volunteers we are responsible to let any and all guests know our policy on this subject in particular. Thank you for your help and understanding. The Lotus and the Center for Wooden Boats is a fun place to relax and socialize, but we are also a family centered community, and our rules regarding alcohol use are intended to create a safe and welcoming environment for all of our visitors, regardless of their age. To that end, alcohol use aboard and on the docks and during our business hours must be confined to a designated event and area approved by a staff person. No member of our Lotus Crew drinks while on duty, when guests are aboard for tours, when the boat is underway or during an event. Any volunteer who appears intoxicated while aboard any vessel at the Center for Wooden Boats including The MV Lotus and her boats or on the docks while on shift or in contact with visitors will be asked to leave the premises immediately, and is subject to dismissal as a volunteer. PARKING ­ volunteers and guests can most easily find parking on West Lake. PETS– are not encouraged to come aboard; requests can be made to the senior crew member aboard. 1.Call 911. State your name and location. 2.Concisely state the problem and what assistance is needed. 3.Stay on phone until dispatcher tells you to hang up. 1.All visitors, volunteers and staff should evacuate the boat and docks. 2.Volunteers and staff gather at the head of the dock. 3.Do not leave the area until you have been accounted for by a staff member. TRESPASSING OR UNRULY DISTURBANCES Please call 911. Above all, our visitors are guests and must be extended the same courtesy we would extend to guests in our own homes. As a volunteer, your hospitality will directly encourage our visitors to return and to recommend the Lotus to their friends. ● Are you open to the public? Definitely! Dockside tours are always free. ● What days are you open? Tea Parties are scheduled for Sundays 11 – 4. Reservations required. 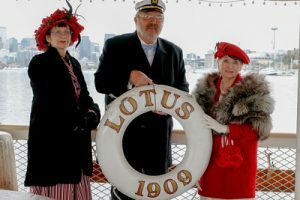 ● Historic Seattle Maritime Experience is the name of our overnight program of spending a day and a night in 1909 Splendid Simplicity, and reservations can be made nearly every day of the year. Family nights are available. All reservations can be made with the head steward by telephone, email or in person. ● Our hours and services vary depending on the season. ● Are you a volunteer? Is everyone here a volunteer? The MV Lotus Foundation owes its continuing success to the efforts of our volunteers. 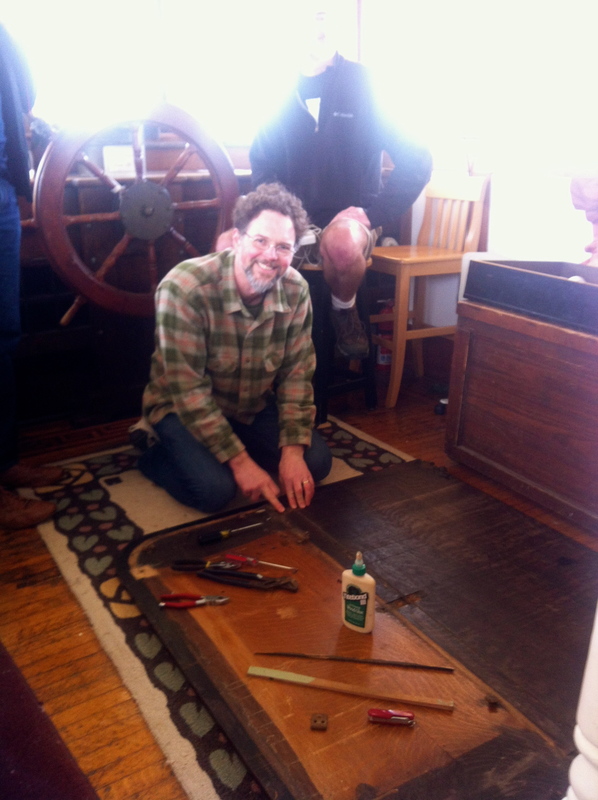 And yes – The skippers, engineers, and stewards are all volunteers. And we are happy to speak with anyone about volunteering. We are a non­profit organization, which is open to the public year round. Anybody can come by. We are not a private club. Can I rent this facility for my wedding/meeting/Cub Scouts? Yes, our facilities are available for special events. Rental rates and more information can be found on our website. ● How is The MV Lotus funded? Part of the MV Lotus funding comes from earned revenue, the rest comes from contributions. Earned income includes donations by guests of our Historic Tours and our Seattle Maritime Experience 1909 of spending a day and night aboard, Tea Parties workshops, small gift sales, and facility rentals. Contributions include, businesses sponsoring events, grants and individual contributions. Donated materials, time and in kind services also help us run our programs. Thanks to everyone for caring about LOTUS ­ we are happy to have you aboard! The M/V Lotus Foundation is a 501(c)3 non-profit organization. Thank you for your offer of Support! Thank you for thinking of LOTUS – we so appreciate your gift. You might want to designate your donation in the name of a loved one or for a particular project. If your company allows matched donations, we will help you make that happen! Credit Card donations are easy by phone. EVERY time you purchase from AMAZON – they give LOTUS a percentage ! HUGE THANKS to OUR SPONSORS ! Center for Wooden Boats – Seattle We are honored to be here – we have found our community and are an active participant in the waterfront programs presented by this magical and beloved corner of Lake Union. Come See, Come Play. Come Today! BioSok™ – Absorbs and biodegrades the oil and fuel from your bilge. Lotus used to have a strong odor of diesel – Not Anymore!! The cause is gone – go to their website Unireminc.com and read about it. Better yet – Buy Some – It Works! Thank you for your generosity. PS – The Sequoia (The Presidents former yacht ) is also a proud and grateful recipient of BioSok generosity. Our photos will hang together on the BioSok Office wall. Dunn Lumber – Seattle est 1907 Thank you for the Excellent Deck Paint – We love the Gaco products – Our decks are waterproof and Beautiful! Thanks for your support now that we are back in Seattle and you are just up the lake! West Marine Excellent Bottom Paint! Thank You Randy Repass and Sally Christine – you came through for Lotus again! and again. See you next haulout 2016! Miller Paint – Seattle est 1890 Excellent Topside Paint! And, from an historic Seattle company! Gougeon Brothers / West Systems Products Thank you for our boat load of Epoxy to rebuild our trim and rails and that great book they wrote on restoration of wooden boats. We have learned so much from you. Henery’s Hardware, Port Townsend Thank you for your generous support as our ship’s store when we are in PT! Northwest School of Wooden Boatbuilding THE place to learn wooden boat building and repair. You were a haven for Lotus years ago and repaired out tiny PenYan shore boat. And then, several of your students rowed out to spend nearly two days on the beach to help us when we were down the winter of 2012. Thanks Hugely!